Bellavista Farmhouses Gozo is a family run business offering a collection of 21 self-catering farmhouses for rent in idyllic countryside in the quaint outskirts of Xaghra village, Gozo, only moments away from the village centre. Every farmhouse with private pool is designed to maximise light and space seamlessly blending traditional features with contemporary living. All 21 farmhouses to rent are beautifully arranged and each commands stunning views of the rolling countryside, glorious sunrises and breathtaking, incandescent sunsets. The name 'Bellavista' acknowledges the sumptuous vistas that are the hallmark of our self-catering farmhouses. Our office lies in the heart of these farmhouses with private pools to rent, ensuring 24-hour, prompt service. Meeting your needs is our pleasure. 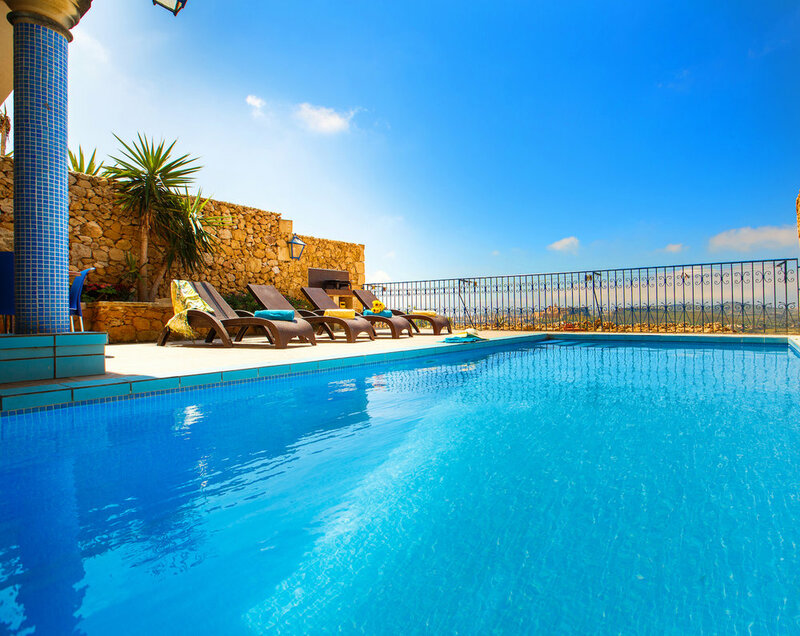 Choose a 2, 3 or 4 bedroom self catering farmhouse in Gozo with a private pool, free WiFi, A/C and all bedrooms ensuite. Bellavista Farmhouses Gozo offer a range of elegantly designed 2, 3 and 4 bedroom self-catering farmhouses to rent. They are all set in one of the finest locations on Gozo - a picturesque cliff-edge setting in Xaghra village. Each farmhouse has its own private entrance and private pool terrace which affords vistas of the rolling countryside - ideal for those with romance on their minds or for those who want to make it a memorable family experience. Free wifi is accessed from anywhere in the farmhouses, including the pool terrace.